Folding wagons are great for hauling groceries, working in your garden, with many of them designed specifically to transport children (the Radio Flier 3-in-1 and Kid's Ultimate) (Source). They generally feature one-hand collapsing, durable tires, telescoping handles, and polyester fabric reinforced with metal frames (Source). The Ollieroo Utility Wagon is the most rugged option- it has a staggering weight capacity of 600 lbs. But it only folds into a flatbed- it doesn't fully collapse. For transporting children, buyers say that the Radio Flier 3-in-1 is the best option. If you're looking to take it on the beach, check out either the TimbeRidge or the Ollieroo. 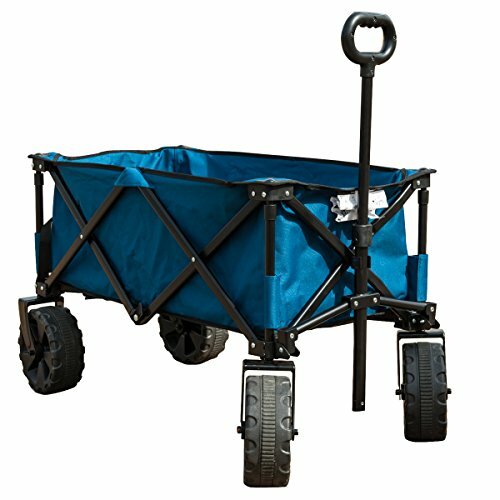 If you're looking for the best collapsible, utility wagon, check out either the YSC or the TimberRidge. This folding wagon offered by YSC is a good option if you are looking for a folding utility shopping cart. Users like the construction and handiness of this wagon, but some do complain about the dimensions and certain design flaws. This all-purpose folding cart weighs only 10 lbs, while having 150 lbs weight capacity. It is made of durable high-strength 600D polyester fabric. It comes in three colors: navy blue, red and deep red.This collapsible wagon seems like a good choice if you are looking for a versatile cart that requires no assembly. The general user consensus concerning the YSC folding utility wagon is that it is a super handy item, great for kiddos and groceries. They state that it has a sturdy construction and yet it is very light-weight. Purchasers are very happy with the product since it is unbelievably easy to fold up and open and when you fold it up it stays folded, rather than slipping back open. It is also very easy to navigate (responds quickly to turning). However, many buyers complain about the size being smaller than advertised, as well as about the uncomfortable and short handle. They advise getting a different wagon for beach trips since this one doesn’t have big enough wheels. This 3-in-1 folding wagon offered by Radio Flyer is a good option if you are looking for a multi-purpose collapsible cart. Users love the usefulness of this product, but do complain about safety issues and some design flaws. This product is a full-sized wagon that folds compactly and offers 3 different modes: 2 kids riding, flatbed hauling and bench seating. It features an easy one hand fold, which is great because you can take or store it anywhere, as well as a telescoping handle for easy transport. There are two styles available: base and canopy. 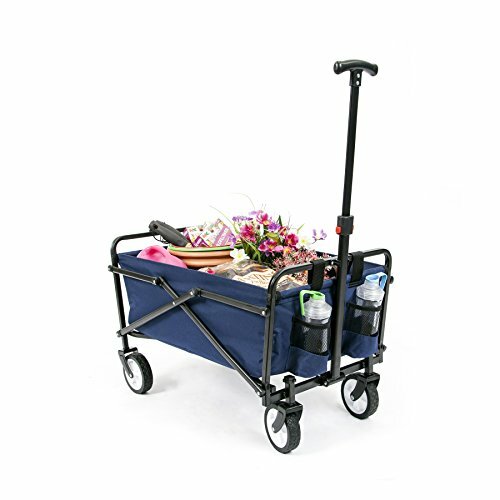 This versatile folding wagon might be a good choice for those who are looking for a durable and comfortable cart. In general, users have a favorable opinion of the Radio Flyer 3-in-1 foldable wagon. What they praise is that it is sturdy with an extremely strong metal frame, yet light-weight and easy to fold flat. However, some buyers complain about the safety. One online reviewer explains that due to the front wheels getting stuck the wagon tends to tip over during tight turns. Also, some purchasers complain about several design flaws (lack of a seat belt,the handle not being long enough). If you are looking for a top-rated folding wagon, you might want to consider this collapsible camping wagon/cart offered by Timber Ridge. Users love the usefulness and quality of this utility wagon, but do complain about certain design drawbacks. This folding cart is made of high-quality, durable and strong 600D polyester. It features a sturdy steel frame with over-sized large wheels that can support up to 150 lbs. If you want a stable and comfortable folding wagon,this garden/beach/shopping cart might be a good option. In general, users have a very favorable opinion of the Timber Ridge folding wagon and they agree that it is strong, sturdy and reliable. As they say, the large wheels roll over everything with ease and the handle pivots to make turning very easy. All in all, it is a good quality product that does its job and folds up nicely. However,purchasers point out that this wagon is not suitable for sandy beaches. Some also state that the handle could be longer. 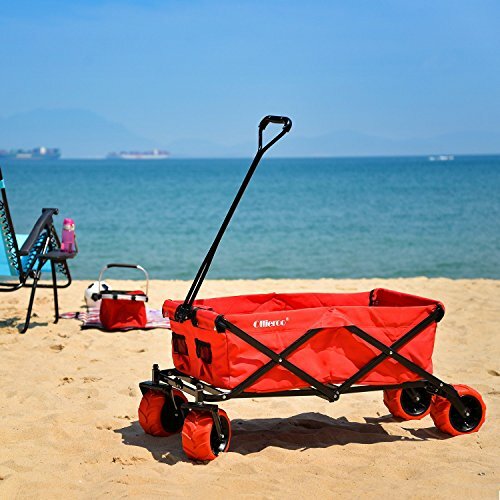 This collapsible cart offered by Ollieroo is a good option for those who need a high-capacity folding wagon.Users love the handiness of this cart, but do agree that it is not suitable for the beach. This product features a heavy-duty 7’’ x 4’’ thick rubber wheels and a large 30’’ handle for easy hauling. It is made of 600D polyester that can be wiped easily with soap and water only. It comes in three colors: blue, green and red-PU Wheels. If you’re looking for a decent, affordable all-terrain wagon, this would be it sans the ability to pull it at the beach. In general, buyers have a positive opinion of the Ollieroo outdoor utility folding wagon. They state that it is solid and chunky and folds up flat. Most of them agree that it is perfect for city use. However,buyers complain about the lack of beach going ability. As they share, it doesn’t pull well with weight in soft sand. One dissatisfied online reviewer says that the frame on her product started to bend after only a few weeks. If you are looking for a folding wagon, you might want to consider this ride-on collapsible cart offered by Radio Flyer. Users love its usefulness when out with kids, but do complain about its weight and certain design flaws. This product is a full-size wagon for 2 riders. It features seat belts for added safety, seat backs for comfortable riding and 4 cup holders. Other features include a removable UV protection canopy, as well as a telescoping handle for easy transport. If you are looking fora foldable wagon that you can use for traveling with kids, this might be a good option. In general, users are happy with the Radio Flyer Kid’s Ultimate Folding Wagon. What they like in particular is that it folds and unfolds easily, rolls easily and has seat belts. All in all, they agree that it is a well made and well-designed folding wagon for people with small children. However, some purchasers complain about uncomfortable and super hard seats, as well as the cart being too heavy. Another frequent complaint is that the wagon falls over when folded. The first folding utility wagon we examined is manufactured by YSC. It comes in a blue, a red and a deep red- it's marketed as an especially lightweight option with a rugged 150-pound weight capacity. Built from polyester fabric, it only weighs a little over 10 pounds, easily collapses to fit in car trunks- a solid solution for traveling to the beach, working in your garden, and shopping at the supermarket for groceries. Reviewers claim that it's best used on hard surfaces and is not truly ideal for beach use. To clean, buyers say that you can hose it down and leave it outside to get dried by the air. Another plus for this particular option is that there isn't any assembly required. As well, it unfolds really easily by pulling on both ends and then straightening. One mother who has three kids tells us that she takes this wagon along all of their daily jaunts- it enables her to pack the groceries and even the children into this rolling solution to make her life easier. Because it takes up so little space, many buyers leave it in their vehicles and employ it as a rolling transport solution whenever going to the grocery store. 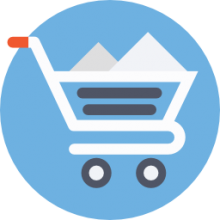 Another buyer says that this collapsible wagon folds up tight to save space and locks in place rather than other options that are prone to falling back open. Yet another reviewer praised how inexpensive it is compared to other options, saying that when he was looking around he was primarily interested in something that easily and automatically collapsed rather than having to be disassembled. Other buyers prioritized all-terrain abilities. Though as we noted before this particular option won't stand up well in the sand or mud. 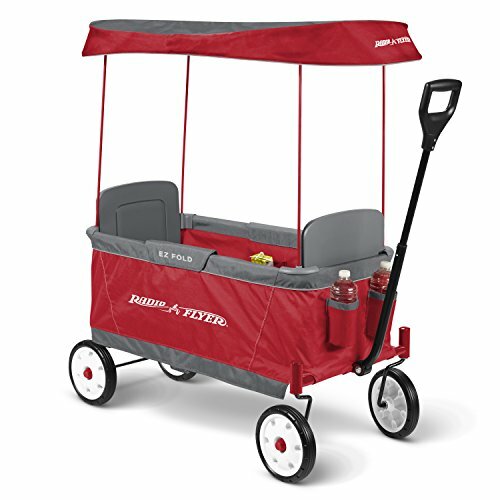 The second option we examined was the Radio Flyer folding wagon- you can buy it with or without a canopy and it is marketed as a bench seat, a rider seat, and a hauling solution. Buyers also say it includes two seat-belts- a handy safety mechanism for security-conscious parents. Another customer says that according to their instruction manual it's designed to be used by children who are over 1 1/2 years old. Because of its fabric sidewall construction, and lack of potentially pinching metal arms, this ensures pain-free transport for young kids. On the downside, some buyers felt it wasn't as sturdy as traditional children's utility wagons that are often reinforced with metal bars. In addition, some buyers criticize its ability to make tight turns- saying the wheels can often get stuck in that instance. The third folding camping wagon we examined is manufactured by TimberRidge. It's built from polyester, has a 150-pound weight capacity with a steel frame that folds up in seconds, a telescoping handle- and most importantly there is no assembly required. One buyer describes using this wagon for her geriatric dog- because he is a large breed and weighs over 100 pounds, they employ this cart as a mobility solution for him. Another buyer says that it provides shake-free transport, is sturdily assembled, folds easily, though it's not quite rugged enough to haul around large dirty objects like firewood. One buyer who lives in Minnesota used it in deep snow drifts and said it worked adequately, though there was some skidding. They've marketed it as a dynamic transportation solution whether you are going on a family vacation, camping or just need an all-purpose trolley. Some buyers did criticize it, saying that it was difficult to perform turns with, was prone to toppling over, and that the frame was subject to bending. However other buyers praised it, saying that even in the sand it didn't get bogged down. 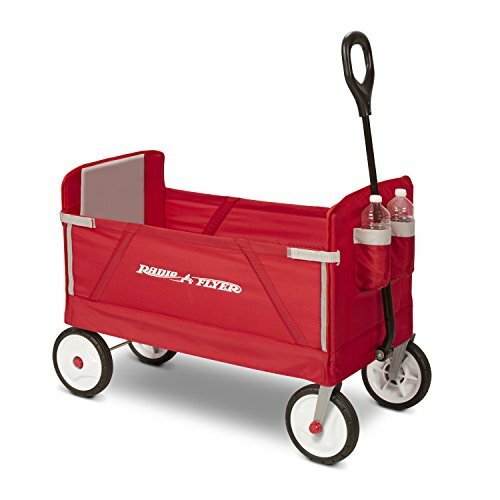 The last option we looked at is marketed towards parents- it is the Radio Flyer folding wagon for two kids. It folds up with one hand, includes two seatbelts, a canopy, and four cupholders. One parent who travels on vacation with his family frequently tells us that the wagon was a great option for trips to Disneyland, as well as transporting their children through airport terminals. However, some buyers thought the folding mechanism was unnecessarily difficult to operate. Another parent tells us that the seats are actually kind of hard and uncomfortable- so it's best to pad them with something so your children don't get fidgety.